It’s easy like Sunday morning at the Riu Republica on Playa Arena Gorda in Punta Cana. East of the gigantic Hard Rock Hotel, the all-inclusive is one of eight Riu Resorts in the Dominican Republic: six in Punta Cana and two in Puerto Plata. With an investment of US$140 million, the Republica is the first adults-only in the Riu ‘Classic’ category, joining the family-friendly Riu Naiboa and Riu Bamboo. 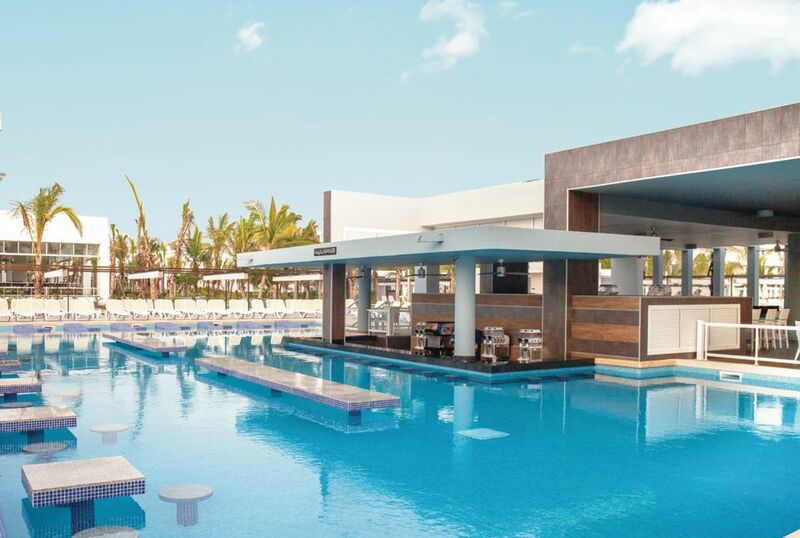 Impressive with more than 1,000 rooms, four restaurants, three pools and spa, the Riu Republica is popular with singles, couples, newlyweds, and honeymooners; the resort hits the bullseye with unlimited food, drink, and fun in the sun. The four-story resort, built new from the ground up, has 1,007 rooms in four categories ranging from a garden-view room to a two-bedroom suite that easily sleeps six. Featuring sleek lines with nothing too fancy, the rooms are pretty cookie-cutter apart from the views. Wi-Fi is fast (and free), balcony doors have screens (a big plus in the Caribbean), the mini-bar is restocked daily, and resort staff is friendly (although it helps to bring a Spanish dictionary or learn a few phrases before you arrive). Playa Arena Gorda means Fat Sand Beach, and this sandy swath is wide with gentle slopes to the sea. Early birds claim the shade of a palm tree or the serenity under a thatched palapa. Give the buffet a break and take your pick from windsurfing, kayaking, snorkeling, water polo and siesta-taking on one of many chaise lounges planted in the sand or around the pools. The epicenter of "all-you-can-eat," La Altagracia is open for breakfast, lunch, and dinner. Surprisingly varied, the buffet features scrambled egg whites and salads shaped like gingerbread men that please calorie-counters; for those ditching the diet, there's roasted pig, juicy ribs and Spanish paella fits the bill. Plenty of outside tables catch the evening breeze, while air conditioning cools the tables inside. For dessert, donuts dripping with chocolate and one-bite cheesecake squares are worth the splurge. Themed restaurants are fun to try, like Kaori for Asian-inspired sushi and noodles and Tagliatella for pastas, pizzas, and antipastos. Quisqueya is poolside dining a la carte for steak and salmon. It's adjacent to the big buffet, so you can snag a salad or two while the chefs are expertly grilling your entree. There is plenty of sipping at five bars, including the Sports Bar open 24 hours a day which works well with early morning departures back to the airport. Bartenders are masters at shaking and stirring heady cocktails like a spicy Bloody Mary and the Doctor Funk, the latter blended with local Ron Dorado, coconut cream, amaretto liqueur, and orange juice rendering it breakfast-ready. Swim-up bars are packed with party people, while the lobby bar is relaxing for a glass of wine and a handful of Spanish green olives. Roaming bartenders top off cups with shots of rum, while a seat on a bar stool is the perfect perch for a frosty beer or afternoon cocktail (or both). When the sun sets, the open-air nightclub, next to the lobby bar, heats up with boogie bands and salsa beats. A modern gym opens early when you need to offset the previous night's indulgences, and the Jacuzzi stays open until 8 p.m. Massage standouts in the Renova Spa run the gamut from an anti-stress rubdown to body wraps for couples. For fitness buffs, dance classes at the RiuFit gazebo and aqua aerobics in the pool are popular. Founded in Mallorca, Spain by the Riu family in 1953, Riu Resorts is an international chain of 100 resorts and hotels in 18 countries including Mexico, Jamaica, St. Martin, and the Dominican Republic. Owned by the family's third generation, the resorts worldwide welcome 4 million travelers yearly. Tee Off at the Best Golf Resorts in the D.R.